P.O.Box 1035, Dartmouth, Nova Scotia, Canada B2Y 4T3. Prior to the introduction of the Individual Transferable Quota (ITQ) programme, the Scotia-Fundy Inshore Groundfish Mobile Gear fleet included 455 licences on vessels up to 64 feet 11 inches in length. These vessels operated under a competitive quota regime. Fishermen utilized mainly otter trawls with a few using Scottish and Danish seines, to fish cod (Gadus morhua), haddock (Melanogrammus aeglefinus), pollock (Pollachius virens), redfish (Sebastes spp), flatfish (Pleuronectiformes) and various groundfish species. 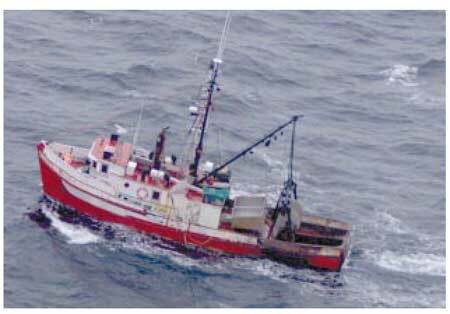 These vessels were based in the Scotia-Fundy fisheries management area and fished in Canadian waters of the Bay of Fundy, Georges Bank and the Scotian Shelf (NAFO Areas 4 and 5). Figure 1 shows the map of the Scotia-Fundy fisheries management area and the NAFO statistical divisions in this region. The ITQ programme applies to inshore mobile gear vessels less than 65 feet. There were also other fleet sectors, the Inshore Fixed Gear and Offshore sectors, not in this programme, that exploit the same groundfish stocks. The Inshore Fixed Gear consisted of about 2500 licensed vessels of less than 65 feet, which employed mainly longline, gillnet and handline gears. The Offshore Sector consisted of three fleets, (a) vessels between 65 and 99 feet 11 inches using mobile gear, (b) vessels 100 feet and over using mobile gear and, (c) vessels 65 feet and over using fixed gear. The Inshore Fixed Gear Fleet operated under a competitive quota regime while the three offshore fleets operated in enterprise allocation (EA) programmes of their own. The Scotia-Fundy inshore groundfish fleets grew dramatically in fishing power since 1977. The number of licences increased in the 1970s and, following limited entry and length controls on various segments of the fleets at different times in the 1976 to 1980 period, vessels grew in tonnage and horsepower during boom periods in 1978-81 and 1987-89. Growth between 1978 and 1981 was supported in part by government financial assistance through loans and subsidies in vessel building. Government financial assistance was greatly curtailed in the early 1980s but the doubling of fish prices between 1985 and 1987 provided fishermen with a major source of funds to finance the fleet growth of 1987-1989 (Haliday et al. 1992). Excess capacity in the groundfish fishery became a significant problem during the 1980s. In the Scotia-Fundy region, the Inshore Mobile Gear fleet was identified as the fleet with the biggest capacity problem. A 1986 study concluded that this fleet was four times the size required to harvest its F0.1 quota (DFO 1986). Annual management plans became increasingly complex as government and industry attempted to share the resource among too many participants and spread fishing activity over the entire year. Limited entry licensing, vessel size limitations, gear restrictions, trip limits and seasonal quotas were some of the management measures introduced in an attempt to curb fleet capacity and fishing effort but few were successful. In 1989, when management plan negotiations broke down, the annual quota for this fleet was caught by June and the fishery subsequently closed, not to be reopened until 1990. Descriptions of the fisheries that formed part of this programme can be found in Parsons (1993). A task force was commissioned in the summer of 1989 to assess the situation. It made many recommendations but a key one was to reduce the fleet capacity. Individual quotas was identified as a way to do that. This ultimately led to the decision by the Minister of the Department of Fisheries and Oceans (DFO) to implement an individual transferable quota programme for this fleet as a means to promote fleet rationalization. The ITQ programme for the Scotia-Fundy Inshore Mobile Gear Groundfish fleet came into effect in January 1991. The initial programme consisted of ITQs for six1 groundfish stocks; they were Cod 4Vn(j-a), Cod 4Vn (m-d), Cod 4VsW, Cod 4X5Y, Haddock 4X5Y and Pollock 4VWX5. The ITQ programme has since expanded to cover twelve groundfish stocks. The remaining six stocks were introduced at various times: Cod 5Z and Haddock 5Z in 1992; Flounder 4VW and Flounder 4X in 1994; and Redfish Unit 2 and Redfish Unit 3 in 1996. All the stocks that entered the programme in later years were also considered during the initial programme, but it was decided not to implement ITQs for them at the time. Table 1 shows the Mobile Gear fleet quotas by stock at the time of implementation. Although the features of the programme were the same for all twelve stocks, there were slight variations in the sharing formulas and the processes used in the sharing of the quotas. The sharing formula and process described in this paper mainly focuses on the initial 1991 programme, with only brief references to the allocations of stocks done in subsequent years. Prior to ITQs, groundfish mobile gear licences were limited entry licences and were only valid when used on a vessel of the appropriate size. The Inshore Mobile Gear Groundfish fishery operated under a competitive quota regime. Licence holders could fish competitively for the allowable fleet quotas subject to the licensing restrictions of their licence and other management measures such as trip limits and seasonal quotas. Licences could be transferred to other full-time fishermen employing the same vessel sizes. Licences could also be banked for a period of up to two years, if the licence holders did not have a vessel to use in the fishery. After ITQs were put in place, licence holders could only fish the specified amount of quotas that were allocated to their licences for the year. Quota rights were allocated on a stock-by-stock basis and were allocated as percentages of the Mobile Gear Inshore fleet catch quotas. The actual tonnage of quota in each stock could vary by year depending on the total allowable catch of the stock for the year. The quotas could be traded either on a temporary (for the year only) or permanent basis. When quotas were traded on a temporary basis, the actual quantities (tonnages) of quota for the year were traded and the permanent percentage shares were not affected. Quota entitlements revert to the permanent quota holder the following year. In permanent trades, the percentage shares were traded along with the corresponding quantities. Only temporary transfers were allowed during the first two years of the programme. Permanent transfers came into effect in 1993 and since then, both permanent and temporary transfers have been allowed. There was also a limit on the maximum amount of quota a licence could accumulate. At the start of the programme in 1991, this limit was set at 2% of the total Mobile Gear fleet quota in all 6 stocks. This 2% applied to the total only, so it was possible for a licence to accumulate more than 2% in any single stock. The 2% limit included both permanent and temporary quotas. As stocks were added to the ITQ programme, the 2% would remain the same but the absolute amount of quota would increase. The groundfish resource decline in 1993 put the quota holdings of some licences over the 2% limit and this limit was subsequently changed to the greater of 2% of the total Inshore Mobile Gear Groundfish quotas or 600t. No banking of quotas were permitted. Any uncaught quotas at the end of the year were not added to the following year's entitlement. Uncaught quotas could be temporarily transferred to other licence holders who had overfished their quotas. There were no pre-set objectives on how the shares were to be divided. Fisheries management committees in the Maritimes Region had always operated based on consensus among members. The allocation process used continued this consensus approach. The allocation formula chosen attempted to minimize the amount of deviations from current levels of activity and also provided some access to those who had not fished in recent years, so enhancing the environment for consensus building. The allocation process started in February 1990 and a Working Group was established. The Working Group consisted of representatives from members of the Mobile Gear Groundfish fleet and groundfish industry associations, Nova Scotia and New Brunswick provincial governments, and DFO. The mandate of the Working Group included: (a) to decide on the stocks to include in the programme, (b) to choose the sharing formula and the appeal system, (c) to set the initial operating guidelines of the programme, and (d) to discuss the effective monitoring of the quotas. Between February and May 1990, the Working Group held three workshops each of 2-3 days in duration and four one-day meetings to formulate the allocation formula. The implementation date for the programme, originally set for 1 May 1990, was deferred to 1 January 1991 due to the complexity of the programme. Notifications of the first set of sharing options and approximate individual shares were mailed to all licence holders in June 1990. The Working Group also held meetings in the summer of 1990 in fishing communities around the Scotia-Fundy fishery management area to explain the proposed programme and hear the views of licence holders. The Working Group held a few more meetings between June and December 1990 to discuss the features of the programme such as transferability options and processes, possible limits on quota accumulation and the duration of the programme. The Working Group considered a number of sharing formula options. Among these were: (a) equal shares, (b) shares based on the level of investment in the fishery, (c) shares based on the number of years in the fishery, (d) shares based on historic catch, (e) shares based on the size of vessel, (f) minimum and maximum shares, and (g) combinations or variations on the above. The advantages and disadvantages of each option were debated and they were also evaluated using simple examples. The sharing formulas that offered better potential for adoption were further evaluated by applying the formula to the actual data and impact analyses were run. The impact analyses were presented to the Working Group who might then decide to discard the option or fine-tune the formula for further consideration. All the data presented to the Working Group did not contain any identification of the vessels or licence holders, to protect the confidentiality of stakeholders and to prevent conflict of interests. A few rounds of analyses were presented to the Working Group before they voted for the final (or semi-final) formula. As will be explained in Section 3.3, there were two separate allocation formulas, (a) one for vessels less than 45 feet (C1) and (b) one for vessels 45-64 feet (C2). The Working Group offered only one sharing option for C1 but two for C2. The C2 licence holders voted for the final formula used. Two mail-outs to all 455 licence holders were made, one in June and one in early December 1990, before the final allocations were sent out in late December 1990. The June mail-out contained information on the licence-vessel histories, catch histories of the licence and approximate quotas in each stock, along with appeals information and forms for appeals. The early December mail-out contained updated information on the catch histories and quota allocations, as well as ballots for the licence holders to choose whether to remain in the programme, preferred features of the programme and on the formula to use for C2 licences. The average best two of four years' mobile gear catch histories of the licence for the years 1986-1989 was chosen as the basis to allocate the quota. Subject to some refinements, quota shares were distributed proportionately based on the average best two of four years' mobile catch histories of the licence in each stock. In the Scotia-Fundy fisheries, groundfish licences could be transferred from one licence holder to another and licences could also be switched from one vessel to another. As a result, the catch history of the licence holder could be different from that of the licence or the vessel. The Working Group chose the catch histories of the licence and not that of the person or vessel as a basis for sharing quotas. There were two allocation formulas, one for licences on vessels less than 45 feet (C1) and one for licences on vessels 45-64 feet (C2). In fact, the Working Group offered two different formulas for C2, and C2 licence holders were asked to vote on the final formula to use. Only the formulas used are presented in this report - details on the other C2 formula can be found in DFO (1991). While the fishery was managed on competitive quotas prior to the ITQ programme, there were separate quotas for each vessel length group and this past division of quotas aided the separate calculation of IQs for each vessel length category. Licences within a category shared the quota in that category and each stock was allocated separately. The basic sharing in both vessel categories was the same - it was proportionate to the average best two of four years' mobile catch histories for the years 1986 to 1989. The main difference between the C1 and C2 formulas was in the minimum allocation and in how the pool of quota to settle appeals was set aside. In the C1 formula, licences with total allocations of less than 7t (for all six stocks) were topped up to 7t, while in C2, there was no top up. It was therefore possible for some C2 licences to have no quota at all. In C1, a pool of quota for allocations arising from appeals (Appeal Pool) was created by taxing 10% of the quota from licences that were not topped up to 7t, excluding the successful appellants. In C2, the Appeal Pool was created by setting aside 1100t or about 7.51% of the C2 quota prior to the individual allocations. In summary, the allocation formula consisted of a basic share, refinements to the basic shares (such as minimum allocation) and settlement of appeals from the pools of quota set aside especially for this purpose. Table 2 summarizes the allocation formulas for C1 and C2. The details of the allocation process including the computational process and settlement of appeals will be described in Sections 4 and 5. The data required for the calculation of the individual shares included the mobile catches by fish stock for each licence for each of the years 1986 to 1989. Other administrative data included the licence holders' names and addresses, and the vessels' home-ports, gross registered tonnage and lengths. Except for the data required for the settlement of appeals, all the data required for the calculation of individual shares were obtained from data kept at the Maritimes Region of the DFO. Two regional DFO data systems, the Licensing System and the Catch and Effort System, provided all the basic data requirements. The Licensing System contained the licence holders and vessels information and tracked the licence, vessel and owner relationships over time. The Catch and Effort System contained the details on the quantities and species of fish caught by vessel. As the vessel licence histories and vessel catch histories were on two separate systems, a major process was involved in linking the data from the two systems in order to track the catch histories to the licence. The catches associated with a licence over time were obtained by taking the catches of the vessels which were used to fish the licence over the corresponding periods the licence was held on the vessels. For example, if a licence was used to fish on two vessels in a year, Vessel A from January 1 to May 15 and Vessel B from May 16 to December 31, then the catch history of the licence (for that year) would be obtained by summing up the catch of Vessel A from January 1 to May 15 and the catch of Vessel B from May 16 to December 31. If, on the other hand, a vessel uses two licences, Licence X between January 1 and Aug 20, and Licence Y between Aug 21 and December 31, then the fish caught by this vessel between January 1 and Aug 20 would be credited to Licence X and the fish caught between Aug 21 and December 31 would be credited to Licence Y. This micro level of linkage was a time consuming exercise as it was compounded by some data problems, such as overlapping dates and banking of licences. This occurred when there was not a one-to-one relationship between licences and vessels at any point in time. In overlapping dates, there could be two or more vessels associated with one licence, or there could be two or more licences associated with one vessel at the same time. This could be due to errors in the source documents or errors in data entries. Fixing these data problems meant going back to the source (paper) documents to find the correct dates and making changes in the data system. Over the course of fixing the problems, a number of iterations had to be run as it was possible that fixing one problem could expose another that had not been evident before. "Banking" problems, (i.e. where a licence was maintained but not in association with a vessel) occurred when the same vessel was associated with two or more licences at the same time. This problem was more of a structural problem than a source document or data entry one. In the Maritimes Region, licences could be banked for a period of up to two years. While the licence was banked, the vessel could be sold or leased to another licence holder to be used in the same or different fishery. The system had to keep the vessel association to the banked licence for policy requirements. Although the majority of the banking problems were solved by changing the computer programme used to extract the data, some manual intervention was also required. Again, this meant going back to the source documents, which was often a time consuming process. Basic sharing, which was based on catch histories in 1986-1989 on a stock by stock basis. Refinements to the basic sharing formula which included the topping-up to minimum allocations and the setting-aside of quotas to settle appeals. Settlement of appeals where successful appellants were given additional quotas from the Pool of quota set aside. Any unused Pool was redistributed back to the non-appellants (excluding licences topped up to 7t in the case of C1). The allocation was done at the stock level. A licence's basic share in each stock was proportionate to the licence's average best two of four years' mobile gear catch history over the years 1986 to 1989. For each fish stock, the sum of all the individual licences' average best two years then formed the total base for the stock (in each category). The individual licence's share of the quota would be equal to the licence's average best two years' history divided by the stock's total base. For each licence, the best two years in each stock were computed separately and it could be possible that Stock A might have the same or different best two years than Stock B. After the basic sharing was done, refinements were made to the basic allocation. These refinements consisted of a series of "top-ups" for licences with low initial quotas and the taxing of quota for the Appeal Pool. The top-up conditions vary, and together with taxing and the appeal process, made the allocation an extremely complex process. The rest of this Section explains steps 1 and 2 of the allocation process. The allocation of quotas to successful appellants was a complex process and is described in the Appeals Section (Section 5). The assignment of stocks to the licences was made according to the licences' home areas. This was done to ensure accessibility or proximity of the licences to the stocks. Moreover, to ensure that some stocks were not over-allocated, the 7t were taken from the stocks in proportion to the respective C1 quota of each stock. After the licences with basic allocations less than 7t were allocated 7t each, the remaining C1 quotas were distributed among the rest of the licences, again using the average best-two-of-four histories. At the same time, a 10% tax was applied to these licences, excluding the successful appellants, to create the Appeal Pool. On doing this however, a few licences that had basic allocations of more than 7t before ended up with less than 7t. This top-up and taxing step was repeated until every licence had a minimum of 7t. An amount equal to 1100t was deducted from the total 1990 C2 quota of 14,640t to create the Appeal Pool. The 1100t was taken from stocks in proportion to the 1990 quota for each stock. The impact of this was equivalent to reducing each basic allocation by 7.51%. After the quota for the Appeal Pool was set aside, the remaining quota in each stock was distributed among the licences based on the average best-two-of-four years' mobile catch histories. There were three main categories for appeals; they were (a) disputes over catch history, (b) dual gear catch history and (c), extenuating circumstances. Licence holders could appeal if they disagreed with the catch histories DFO sent to them. The discrepancies in catch histories could be due to one or both of the following two factors: (a) differences in the licence-vessel histories, and (b) differences in the quantities of catches that were credited to the licence even though the licence-vessel histories were correct. Licence holders who appealed their licence-vessel histories had to complete a form with the licence holder name, vessel name and time-period the licence was registered on the vessel. Those with correct licence-vessel histories but incorrect catch histories credited to the licence had to submit purchase slips (sales slips issued by the buyer when fish was sold) and logbook records (records of where the fishing occurred and estimates of amounts of fish caught) of the landings made for the period in dispute. Only the mobile gear catch histories were used in the basic allocation formula. There were some licences holders who routinely fished groundfish using both mobile and fixed gears. These licence holders could appeal to get credits for their fixed gear catches if they routinely fished groundfish using both gears in the same year. Licence holders had to submit a letter requesting to be considered for this appeal category. There was no need to submit their fixed gear catch histories as these catches would be in DFO's data systems, unless of course there were discrepancies between their catch records and DFO records. Included in this category for appeal were circumstances such as (a) licence holder acquired the licence or vessel during the review period, (b) vessel breakdown or under construction, and (c) family or health problems. Licence holders had to submit a letter describing the circumstances, historical earnings and expenses information as well as a projection for 1991 earnings and expenses. They could also opt to have their historical data confirmed through taxation or unemployment insurance data sources by signing a Revenue Canada or Unemployment Insurance Compensation information release declaration. The Working Group set the terms of reference for the appeals and appointed an Allocation Review Board to determine the appeals allocations. The selected board consisted of DFO area managers from the three Maritimes Regions - Eastern Nova Scotia (ENS), Western Nova Scotia (WNS) and Southwest New Brunswick (SWNB). In addition to the Allocation Review Board members, nine industry observers were also selected by the Working Group. The nine observers selected were from members of the Inshore Mobile Gear Groundfish fleet, three each from ENS, WNS and SWNB. The role of the industry observers was to attend the appeal hearings as observers to ensure that the appeals were conducted fairly and in accordance with the guidelines. Up to three observers could be present at any review or hearing session but they could not participate in the deliberations of the Allocation Review Board. The observers had to sign an oath that they would treat the reviews or hearings as strictly confidential. They could not discuss the case with the licence holder at any time. Observers could, if they felt a particular case has been handled improperly or unfairly, submit a written report to the Minister of DFO. Licence holders appealing their cases had to file appeals with the required supporting documents. The appeals were submitted to the Task Force office, described in Section 6.1. Staff at the Task Force office and other DFO employees would then verify the claims and report to the Allocation Review Board during the review sessions. The review sessions were directed by a chairperson, selected from among the three Board members, and attended by the remaining two Board members, a secretary who would be non-voting and up to three industry observers. After a case has been reviewed, the Board would either render its initial recommendation, or if it was felt that more information was required to reach a decision, it might ask for additional information or schedule a hearing and request the licence holder to attend. Licence holders could attend the hearings with a spokesperson. The Board would render the final recommendation on a case after all cases had been reviewed or heard. The formula and source of quota used to settle the appeals depended on the type of appeal. Discrepancies in catch histories would simply be corrected in DFO records and the shares re-calculated using the revised data. Quota from the Appeal Pool was not used for the mobile gear catch history appeals. The gains in quotas made by these appellants would come from the proportionate losses among the remaining licence holders. Quota in the Appeal Pool was only used for the Dual Gear and Extenuating Circumstances appeals. The awards for the Dual Gear and Extenuating Circumstances appeals were not given explicitly in quantities of quota, but in amount of catch histories, which in turn might or might not entitle the appellants to more quotas. The following explains the details of the awards in each category. Catch history appeals were settled through redistribution of quota based on the revised best-two-of-four year mobile catch histories. In other words, the gains for the successful appellants were taken proportionately from those who did not appeal. Depending on whether the additional history affected the best or second best year, it was possible that the additional history did not result in more quota. The new average would only be higher than the original if the approved catches changed the best or second best year. As before, this was done on a stock-by-stock basis. The fixed gear catch histories were used as the histories to earn the licences more quotas. For those who appealed on the basis of extenuating circumstances, the new (catch) histories were explicitly assigned using one of the following five formulas. In a few cases, two formulas were considered and the formula that gave the appellant more quota was used. The sum of 75% of the licence's best year's catch and 25% of the second best year's catch. This formula was awarded to licence holders who had acquired a new vessel but had 4 years of catch history. One hundred and thirty three percent (133%) of the licence's catch in 1989. This was awarded to licence holders who only had one full year of history in 1989. The average of the average best two of four years' mobile catch histories for active vessels in the same tonnage class. The tonnage classes were in 5 gross ton intervals. This formula was awarded to licence holders who had no control over the licences' catch histories. Thirty three percent (33%) of Formula C. This was awarded to licence holders who had no commitment to groundfish but a sustained commitment to another year-round fishery. One hundred and twenty five percent (125%) of the licence's best year's catch. This was awarded to licence holders who had one full year of activity other than 1989. Formulas A, B and D used the licence's own catch history. Adjustments were made on a stock-by-stock basis. As before, a licence could have different best or second best years for different stocks under Formulas A or D.
Under Formulas C and C Modified, the licences' catch histories, if there were any, were not used. The licences were assigned catch histories based on the average best-two-of-four years' catch histories of licences in the same tonnage group. The tonnage groups were divided in 5 gross ton intervals; for example, a licence on a 33-gross-ton vessel would be assigned the average of all the catches by vessels between 30-34 gross tons. The assignment of histories to individual stocks was made according to proximity of the stocks to the licences' homeports. The stocks and proportions of total catch history assigned to each licence also varied by tonnage group. The hierarchy for the adjustments for licences that appealed on all three reasons was as follows: (a) Catch History, (b) Dual Gear, and (c) Extenuating Circumstances. This means that any application of the formula used for Extenuating Circumstances would be made after all Catch History and Dual Gear adjustments had been made. The award formulas, all expressed in quantities of catch histories, were then grouped together by stock and shared the quota available in the Appeal Pool. As will be explained in the following section, the whole amount in the Pool was not always all used in allocations to appellants. Quota in the Appeal Pool was used for the successful appellants on Dual Gear and Extenuating Circumstances. The after-appeals quota for a licence was obtained by calculating the additional quota based on the additional history, and adding this to the licence's before-appeals quota; again, this was done on a stock-by-stock basis. The successful appellants' additional histories for each stock would be the difference between the new and the original histories. The additional quotas were calculated by distributing the amount of quota in the Appeal Pool among the additional histories on a stock-by-stock basis. In some stocks, there were enough quotas available to settle all appeals at the original quota-history ratios. The original quota-history ratio was the 1990 quota divided by the sum of the average best-two-of-four mobile catch histories of all licences (in the category) for the stock. Table 3 shows the 1990 quotas, the sum of the average best-two-of-four years' mobile catch histories and the quota-history ratios in each stock. When there was enough quota in the Appeal Pool to settle all appeals at the original quota-history ratio, the additional histories were given quotas at the original quota-history rate (for the stock) and any unused quota was redistributed proportionately back to those who contributed to the Pool. This was to ensure that an additional tonne of history of the successful appellants would not give them more quotas than a tonne of original history of the non-appellants. In some stocks, however, there was not enough quota available to award appellants at the original quota-history ratio, in which case, each successful appellant took a proportionate reduction and the whole Pool was used up. In C1, there were enough quotas in the Pool to award successful appellants at the original quota-history rate for three stocks, while in C2, all six stocks had enough quotas in the Pool to award appellants at the original quota-history ratios. The after-appeals quotas were then obtained by adding the additional quotas to the before-appeals quotas. While a licence's total quota in all six stocks was higher after appeals (compared to before appeals), it was not necessarily the case for every stock. It was possible that the after appeals quota was lower for some stocks if the original catch histories in the stocks were higher than what were awarded under the appeal formulas. It was also possible that the formula awarded to some licences gave them less fish than their original allocation. This was likely to occur under the Formula C and C Modified awards. When the appeal awards gave them less quota than their original entitlement, they were given back their original entitlements and the appeal awards were not used. The computation of additional quotas was repeated for the remaining successful appellants until every one was at least equal or better off after appeals. A Task Force office was set up in the summer of 1989 during the Task Force study into the groundfish crisis. This office operated throughout the ITQ Programme implementation stage in 1990. It had a staff of three, consisting of a manager, an analyst and an office administrator. During 1990, this office handled all matters related to the implementation of the ITQ Programme, including answering inquiries from the industry, handling the correspondence to licence holders, providing administrative support to the Working Group and industry consultations, conducting data and document checks and providing support to the Allocation Review Board. The operation of this office continued for about a year after the implementation of ITQs to develop and implement the Catch Monitoring Programme, which is a programme for the dockside reporting of fish landed. The Catch Monitoring Programme was a mandatory requirement of the ITQ Programme. Besides the Task Force staff, there were also a number of other DFO employees involved. The DFO representatives on the Working Group were two senior managers from the Maritimes Region. Besides the two senior managers, a DFO Fisheries Management manager and a DFO economist also attended most of the Working Group meetings and helped to develop options and facilitate discussions. The technical work on the calculation of the individual shares was managed by another DFO economist and supported by a computer programmer and additional programmers on an as-required basis. The technical work on the allocation of shares, including running the impact analyses, quality control of data, awarding of appeal quotas, and preparing the quota reports to licence holders was almost a full time job for the technical team for about six months. In addition, two other DFO employees in the Maritimes Region were also involved in the data checking and document validation for about two months. There was some special funding from DFO available for this Programme. All the expenses of the Task Force office including the salaries of the three staff, the salaries of the computer programmers, the travelling costs of DFO and industry members to the Working Group meetings, and the expenses of the Allocation Review Board came from this special allocation. The salaries of the other DFO staff involved were paid out of their normal operating budgets. As already indicated in Section 3.1, there were no pre-set objectives on how the shares were to be divided. The Working Group, composed mainly of fishing industry stakeholders, designed the sharing formula and set the terms of reference for the appeals. This was done in an environment of open dialogue and consensus building. There was general acceptance of the allocation and appeal processes. As could be expected, there were some disagreements during the Working Group discussions, and some complaints from licence holders who claimed that DFO did not have all their catch history records and the low level of the quotas they were allocated. The complaints on catch history records were dealt with through the appeals process described earlier. The complaints on low levels of quotas arose mainly because licence holders did not realize that the average best-two-of-four years formula used as the basis for sharing was an inflated catch history base. By definition, the average best-two-of-four years' catch in any stock would be higher than the average catch of all four years, and even if the quota levels were to remain constant over the 1986-1990 period, a tonne of average best-two-of-four years' history would result in less than a tonne of quota allocation. As shown in Table 3, the quota-history ratios varied by stock and ranged from 0.22 to 1.31. On average, the quota-history ratio was just over 0.50 for all stocks. The acceptance of the basic sharing formula and appeals process was also indicated by the continued use of the catch history of the licence as the primary basis for sharing quotas in stocks that came into ITQs in later years. The appeals process appeared to be fair to licence holders as well. The transparency of the appeals process with its clear guidelines and the presence of industry observers also helped. In fact, in the 1992 allocation of Cod 5Z and Haddock 5Z, the ITQ Management Committee requested that the original Review Allocation Board members conduct the appeals again. However, this request was rejected by the original Board members! The process of involving industry participation in the allocation process and letting the licence holders choose the features of the program continued the DFO practice of co-management, involving stake holders in fisheries management. If the allocations were to be done today, there would likely be little change from the process employed then. The use of catch history as the primary basis for the sharing of quotas appears to be the preferred choice among licence holders in the groundfish fishery, as is evident by the subsequent uses of catch histories in the sharing formulas of other stocks in later years. Catch history was also used as the primary basis to allocate individual quotas in the Scotia-Fundy Groundfish Fixed Gear 45'-64' fleet in 1997. The use of catch histories minimized the disruptions from current activity levels and should provide for a smoother transition from the old to the new regime. More recent discussions on individual quota allocations have tended towards having a small portion of the quota allocated based on equal shares to give access to those with low catch histories. While this was not an explicit feature of the formula, the minimum allocation of seven tonnes in the C1 group was another way of giving access to those licence holders with low catch histories. A similar minimum allocation of 50t was also proposed for licences with low catch histories in the other C2 formula, but the licence holders voted not to adopt it. Topping up to minimum allocations would generally give a higher level of access to those with low catch histories when compared to allocating a small portion of quota based on equal shares and this practice reduces the gap between the highest and lowest allocations. The different formulas for appeal awards and the awarding of two formula choices in some cases made the allocation of appeals extremely complex. There was no guarantee that the successful appellants would get more quota as a result and numerous iterations had to be run to ensure that they did not end up with less quotas after a successful appeal. While still using catch histories as the basis for allocating quotas for appellants, the ITQ Management Board also recognized the complexity of the original award formulas. In allocations of individual quotas in later years they moved away from the complicated five-formula award system to a simplified version. Overall, the allocation process and sharing formulas used in the initial ITQ program in 1991 appeared to be well accepted by the industry. The author would like to thank the following people at the Department of Fisheries and Oceans, Maritimes Region, for their contributions to make this paper possible; G. Leo Brander, D. Leslie Burke, Robert Huggins, Don Digou and Jorgen Hansen for providing some of the background information and helping to reconstruct some of the events that occurred in 1990, and Norwood Whynot for providing the Scotia-Fundy Management map. The author also wished to specifically thank G. Leo Brander for reviewing the report and providing many useful comments. Any errors or omissions are the sole responsibility of the author and any views expressed here are those of the author and may not be those of the Department of Fisheries and Oceans. DFO 1986. Capacity Management for the Groundfish Fishery: A Study of the Western Scotia-Fundy Small Vessel Fleet. 1986. MS Report. Haché, J.-E., 1989. Report of the Scotia-Fundy Groundfish Task Force. Department of Fisheries and Oceans. Ministry of Supply and Services Canada 1989. Cat. No. Fs 23-157/1989E ISBN 0-662-17464-X. DFO 1990. Commercial Fisheries Licensing Policy for Eastern Canada, 1990, Department of Fisheries and Oceans. Ministry of Supply and Services Canada 1990. Fs23-88/1990. ISBN 0-662-57712-4. June 1990. DFO Scotia Fundy Region Individual Transferable Quota Program (ITQ) Mobile Gear Groundfish Vessels Under 65 Feet: Operational Guidelines. MS Report. Halliday, R.G., F.G. Peacock and D.L. Burke 1992. Development of Management Measures for the Groundfish Fishery in Atlantic Canada: A Case Study of the Nova Scotia Inshore Fleet, Marine Policy, 411-426. Liew, D.S.K. 1999. Measurement of Concentration in Canada's Scotia-Fundy Inshore Groundfish Fishery. In Shotton, R. (Ed) 2000. Proceedings of the Conference on the User of Property Rights in Fisheries Management. Workshop Papers. FAO Fish. Tech. Pap. 404/2: 279-287. Parsons, L.S. 1993. Management of Marine Fisheries in Canada. National Research Council of Canada and Department of Fisheries and Oceans, Ottawa. Can. Bull. Fish. Aquatic Sci. 225. 1 Original calculations were made for eight stocks. Cod 4X and Cod 5Y were 2 different stocks at the start of the allocation process but they were combined as one stock, Cod 4X5Y, in December 1990. ITQ shares were also calculated for Haddock 4TVW, but were not allocated to licence holders when it was decided to manage this stock as a by-catch of the cod and pollock fisheries. These changes reduced the number of stocks with percentage shares allocated to six.